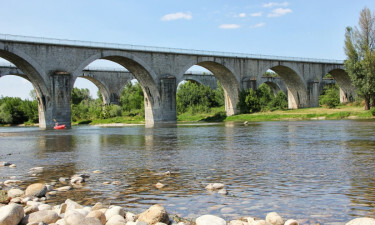 Camping La Bastide en Ardèche Campsite - luxury camping site is situated on the banks of the spectacular Ardèche River. La Bastide en Ardèche luxury camping site is situated on the banks of the spectacular Ardèche River. The park grounds sit at the base of the 17th century Château de Sampzon. The castle-like structure is surrounded by dense wooded slopes, making it an idyllic getaway with its beautiful, scenic views and peaceful, tranquil atmosphere. For further information on how to book your mobile home, contact LUX-camp today to get your luxury camping experience under way. Welcome to La Bastide en Ardèche Campsite. About La Bastide en Ardèche Campsite. What is unique about a camping holiday at La Bastide en Ardèche? Conveniently located near the majestic Pont d’Arc tourist attraction. Easy access to the picturesque Ardèche River. Surrounding areas provide a choice of excursions. High quality standards in onsite amenities and activities. The park has a pool complex, one for adults and a smaller one for kids. Sun loungers dot the surrounding terrace and friendly staff organize water sport hours so the kids can join in on some water games. There is an onsite children's club as well as strategically placed playing areas. If you are the sporty type, you will not be disappointed with badminton, tennis, table tennis and boules pitches - all available onsite. As if that is not enough physical activity, you can also organize canoeing, kayaking, cycling and fishing trips on the nearby river. 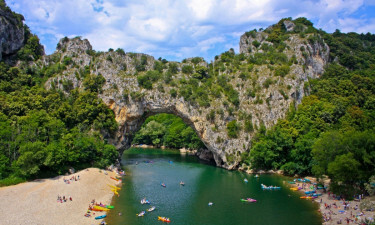 Pont d’Arc is a naturally evolved rock structure that forms an over-hanging arc of gigantic proportions. Every season, this stunning part of coastal southern France attracts holidaymakers from around the globe. The area retains its remote and rural beauty, with coves and caves ripe for exploration. If you would rather just soak up the sun and magnificent scenic views, there is a sandy beach to lounge on. Watch the many canoeists speed through the waters past through the limestone marvel - or simply make it a family day out, with an enjoyable picnic on the grassy banks. No matter the accommodation option chosen, La Bastide en Ardèche park comes fully equipped with all modern conveniences. Accommodation includes baby baths and changing facilities, as well as washing machines, dryers, hot showers and toilets. The friendly, multilingual staff can provide safekeeping options, with wi-fi and Internet access available for a small charge. They also organize beauty treatments, local excursions and sports competitions for family participation. There is lively, evening entertainment that includes a children's disco. A gas barbecue is free of charge and they will even give you a welcome pack. The La Bastide en Ardèche holiday resort prides itself on its resident restaurant, La Bastide. It has indoor and terraced seating and offers a wide range of choices to suit international palates. 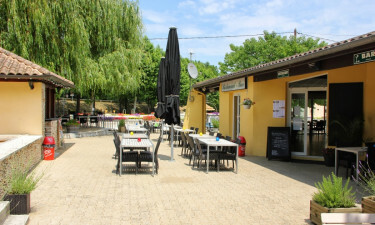 There is also traditional French cuisine on offer plus a pizzeria and take-away service; you can also enjoy a cool cocktail in their onsite bar.